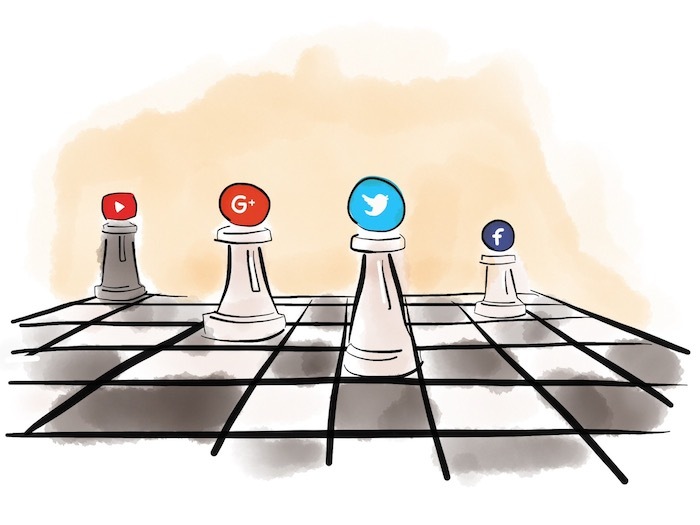 If you’re an entrepreneur you probably care about social media strategy. And if you do some creative stuff you care even more about creating a following. Social media has been traditionally known for it’s “soft selling.” Your social content promotes your business, converts readers, and generates profit. If your work is somehow related to social media you probably know exactly what I’m referring to. And you probably know the feeling of waiting for shares and likes, subscriptions, retweets, sign ups, buy it clicks. Or maybe you just sit there wondering why you don’t get any. But here’s the thing with creating a following. You need to give something first, in order to get something in return. Gary Vaynerchuk – I assume you know the guy, since you care about your social media marketing strategy – summed it up perfectly. He compared social media actions to boxing. He’s straight to the point, isn’t he? Gary came up with the jab, jab, jab, right hook strategy. And no, it doesn’t mean that you should knock your customers out with your content. It simply means that you should give give give and then ask. Jabs are the pieces of content that benefit your customers by teaching them, making them laugh, ponder, feel appreciated. And right hooks are calls to action that benefit your business. Now, the fundamental mistake people do on social media is that they just ask, ask, ask all the time and then wonder why nobody responds. Why is that? When marketers are planning their strategies, they usually plan for the “right hook” – the next sale, big campaign that’s going to knock out the competition. Even companies committed to jabbing—patiently engaging with customers to build the relationships crucial to successful social media campaigns—want to land the punch that will take down their opponent or their customer’s resistance in one blow. Right hooks convert traffic to sales and easily show results. Except when they don’t. Giving nothing and asking is like going to the ring, blowing right hook and expecting an instant win. I’m not an ardent fan of boxing, but as far as I’m concerned, that’s not how it works. The jab, jab, jab, right hook strategy is about consistently giving value to the user and then follow through with a solid ask. But the combination matters too. When it comes to creating a value in your content, I want to show you two paths you can choose. Let’s take video content for example. You have a YouTube channel and you want to make a video of a book review. Putting a link to the book under your video will not make people pay any extra by using it, but you get a commission from Amazon. There are two choices of making this video. You make a 2 minutes video in your room, where everyone can see your bathroom door in the back, and the quality of the video seems to be from the 90’s. In the video you mostly use phrases like: “this book is great, buy it and you’ll be successful in your life.” “You should really trust me on this one!” “This book changed my life. So go and get it now, the link is under the video!” “Oh, and don’t forget to subscribe!” Sounds familiar? You buy video equipment, consider the scenery, learn how to edit your sound and write a meaningful script that will actually teach people things. You give them some tidbits from the book or a quick sneak peak of a strategy used in the book. And you can constantly go with this strategy with no exceptions. First option is the one when you don’t give anything valuable to people but you want something back in return. You want them to use your link to buy a book so you can get a commission. It’s a right hook only. And it won’t get you anywhere in a long term. Take a look at it from the viewers’ perspective – they came to your channel because they want to learn something. Yet they weren’t given anything. They leave and never come back again. If you choose option 2, people watch few of your videos, they learn a lot from them, love the channel (or the author) and they want to support you. Why? Because you’re giving them a true value. In result they want to read the book to learn the whole thing you were talking about. And even if they won’t find a link to Amazon, sometimes they may ask for it. Why? Just because they support you and they want to give you something in return. Sujan Patel, an entrepreneur and marketer, in his Forbes post wrote about taking content marketing to the next level. He speaks from his experience and advices to focus on quality over quantity which worked well for him. I’ve always seen better results in terms of traffic and social shares when I publish fewer, longer content pieces than when I try to pump out tons of smaller posts. If you’re struggling to keep up with a grueling publishing calendar that isn’t getting you results, change up your strategy and set quality as your main objective. Turns out people more likely share valuable pieces of content that can teach them something and make them look good for sharing. Also, take your time and think about how your social media marketing strategy will help you achieve your business goals. Identify your weaknesses, and think about your strengths and how social media will help you make these areas better. So before publishing any type of content, ask yourself: does it offer value to my reader? Does it bring me closer to achieve my business goals? Don’t rush yourself and don’t do things just to get them done. Publish valuable things that people can use in few months. That kind of content wins at the end. Taking the time to think about your social media marketing strategy will help you figure out what your overarching business goals are. You need to identify your weaknesses, and think about how social media may be able to help you overcome them. You also need to think about your strengths, and how social media will help you make these areas even better. How can I provide value in 140 characters? Once you wrote a valuable piece of content on your blog or you put a video recommending a new book, you probably plan to use Twitter to promote it (Check out the post: “How to use Twitter for business“). While high quality content on your blog or outstanding business product is a baseline to grow in social media, linking to your blog or product is not the only way to add value on Twitter. We have a lot of book authors today. You probably see many of them on Twitter. Most of their tweets are links to their books. All the time. Every day. 10 times a day. I know that promotion is essential part of publishing, so why not linking to your book, right? But as long as their books provide value, these kind of tweets don’t. Maybe it’s easy to say, but think about it. Don’t you have a bigger chances with retweets when you post something else too? Right before people decide to follow you, they check your past tweets. How do you think they react when they see only tweets about the same book? It’s the same with business owners linking only to their page. It’s pointless. That kind of strategy is the wrong way to use Twitter. It’s informing and it doesn’t give any value. If you do that, it’s time to step up. Simon Sinek Twitter is a great example for that matter. Almost all of his tweets are value, value, value (which is just giving). And then after twenty tweets like these, he puts one link to his video or post. The more you give, the higher are the chances that people react once you finally ask for something. In the noisy online world people see tons of information, advertising and asking for something every day. If you care about your social media marketing strategy you need to stand out. You need to stop asking for everything all the time. Give hundred times and then ask. As Gary says: content wins… so give it a serious thought. I believe that content needs to provide value and teach something. If it’s not valuable, people maybe will read it or watch it but that’s it. They won’t take any action. Because what for? Sharing it won’t make them look good, professional or smart (and we all want to be seen that way). So let’s focus on the jabs, I mean pieces of content you can provide value with.